Paloma has evolved into many different areas, or habitats if you like. Although all areas continue to develop, some were started 30 years ago while others are in their very early years. We would prefer you to experience the garden as a whole, however below are some areas that convey the essence of Paloma. From the carpark, you pass through the garden entry, the Tunnel House, and arrive in the Palm Garden. This is the longest established area that was first started in 1982. It is largely a garden of bamboos, alocasias, ferns, orchids, and cycads; as well it includes many of the 130 palm species growing at Paloma. This area could be subtitled a xerophytic or Mediterranean garden, but because of Nicki's French heritage and our love of the Mediterranean, we call it Le Jardin Exotique de Paloma. It is perhaps the largest area of Paloma, excluding the arboreta, stretching from the Red House to the Matchless Arboretum. 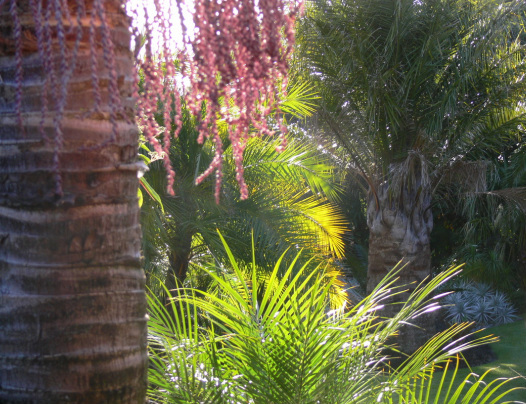 The planting is varied and ranges from palms, cycads, cacti, succulents to many unusual trees. 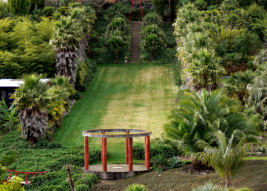 Perhaps the heart of the garden is the Wedding Lawn, a large expansive lawn defined by an avenue of Washingtonia palms. Our bed and breakfast, the Red House, over looks the Wedding Lawn and its adjacent barbecue area (booking required). The soul of Paloma, our Bamboo forests are spectacular and awe-inspiringly beautiful. They range from big groves of timber bamboo to rare species of clumping bamboos. The Palm Forest is evolving into one of our favourite areas. After 20 years we now have trunks many metres high, giving us a microclimate where we can grow an exciting range of plants, including ground orchids, clivias, bromeliads, arisemas, and special shrubs. The dominant palm is Livistona decipiens with some Brahea edulis. Subtropica is found beyond the phone box and is Paloma's subtropical jungle. Tree-planting began here in 1990. There are many rare and beautiful trees in this valley, including Pinus bungeana, the golden Metasequoia, Abies concolor ‘Candicans’, many Podocarpus and Araucaria, to name a few. A group of our favourite, Araucaria laubenfelsi, is well down the valley on the right-hand skyline as you follow the track down to the valley bottom. All trees are labelled. This arboretum was first established in the mid-seventies and tree-planting continues to this day. The trees range from the Arctic circle to the tropics. In the arboretum’s early days, there was an emphasis on oaks, maples and magnolias. More recently, there has been more of a focus on Southern Hemisphere conifers and temperate to subtropical evergreens and oleanders. All trees are labelled. The one-kilometre Norton Arboretum loop walk leads you by Clive’s large sculptural installation, called Longway. Longway comprises an earth labyrinth with symbols of our family’s ethnicity nearby. 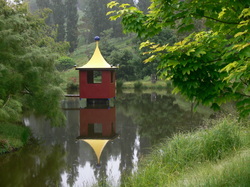 Another feature is a pond with a summerhouse upon it, the Houdaki House. All plants in the Michael Capenerhurst Desert House (Desert House) were given to us. Not one was bought and 99 percent of these cacti and succulents came from Michael Capenerhurst, who now focuses on fine art painting. Michael built up this collection, which he grew largely from seed, from the early 1980s - therefore, some of the older plants in here are 30 years old. Most of these plants are cacti. All cacti come from the Americas, north and south. The Desert House also boasts a few non-cacti plants. These include two Agave and one yucca species, all of which are also from the Americas. In addition, there are two Aloes in the Desert House. All Aloes are from Africa. Also, there are one Pachypodium and five Euphorbias, all African. 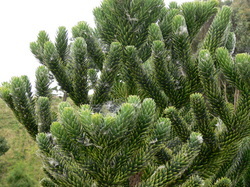 Euphorbias are found in just about every part of the world, including New Zealand, but the cactus-type Euphorbias are largely from Africa. Finally, we have one Alluaudia, from Madagascar, five Conophytums and one Lithop, all from Africa, plus a few other odds and ends. There are many fascinating books on poisonous plants and some of these inspired the birth of our Garden of Death (GoD) in 2008. The acronym, GoD, appealed to our perverse sense of humour. The GoD presents plants that demonstrate society’s contradictory perceptions of what is right versus what is wrong. In planning this garden, we discovered extensive history with many fascinating stories, which we wish to convey through the garden. Eventually the GoD will provide extensive interpretation of some of our social history. Guided tours of our GoD will eventually be available, watch our news page for developments!